What policies and practices will help more young people explore jobs in computer science, information technology and related areas? Chaired by Arkansas Governor and SREB Chair Asa Hutchinson, the Commission on Computer Science and Information Technology was charged with helping states expand access to challenging educational experiences in the fields of computer science, information technology and cybersecurity. 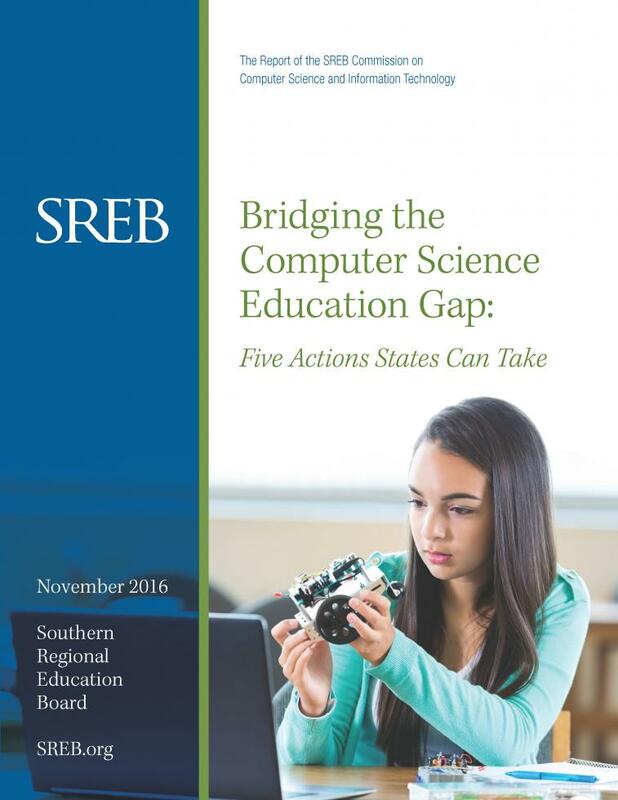 SREB’s Commission on Computer Science and Information Technology offers five actions for states and schools to help more young people — especially girls, black and Hispanic students, and students from low-income families — learn computer science and explore and choose careers in computing fields. Atlanta, December 6, 2016 — As schools celebrate Computer Science Education Week, the Southern Regional Education Board today released the report of its Commission on Computer Science and Information Technology. At the first meeting of the Commission on Computer Science and Information Technology in October 2015 in Little Rock, members learned about labor market demand for computer science and IT credentials and degrees. They heard from guest speakers about the National Science Foundation’s efforts to design engaging new curricula, the essential elements of cybersecurity pathways, and how the Pentagon trains those who serve the nation’s cyber-defense systems. Kirsten Ewart Sundell is the division director of product development and communication at the Southern Regional Education Board. In this role, she contributes to the creation and dissemination of timely, impactful publications that empower educators, school administrators, district and state education agency personnel, and policymakers to solve pressing problems in education. She is the co-author of Bridging the Computer Science Education Gap, which offers states actions they can take to help more students learn computer science and explore computing careers.